Gustave Caillebotte (August 19, 1848 – February 21, 1894), was a wealthy and generous French painter. Caillebotte originally sought a career as a lawyer, but his youthful interest in painting led him to study under Léon Bonnat. Caillebotte soon became a friend and a major patron of the group of artists known as Impressionists. While Caillebotte's own style belongs to the school of Realism, he also shared certain traits of the Impressionists. He is best known for his paintings of urban Paris. These paintings were quite controversial for their banal and often lower-class subjects as well as the cropping and "zooming in" techniques he employed as a result of his interest in photography. Caillebotte used his wealth to become something of a renaissance man as he collected the art of his contemporaries and stamps (his collection is now in the British Museum), as well as became an expert in orchid horticulture, yacht building, and even textile design. Gustave Caillebotte was born to a life of privilege and wealth on August 19, 1848. His father, Martial Caillebotte (1799-1874), inherited the family fortune and became the proprietor of the Caillebotte family textile industry. Martial Caillebotte also held the esteemed position of judge at the Seine's Tribunal de Commerce. Martial Caillebotte was married and widowed twice in his younger years. His third marriage to Céleste Daufresne (1819-1878) resulted in three sons. Gustave was the first born, followed by René (1851-1876) and Martial (1853-1910). The Caillebotte family home was located on one of the most famous streets in Paris, the rue du Faubourg-Saint-Denis. The family occupied a home there until 1866, when Martial decided to build a home on rue de Miromesnil in Paris. At this time, the Caillebotte family began vacationing during the summer months in the small town of Yerres. Yerres is 12 miles south of Paris, and located near a beautiful river and relaxing countryside. The beauty and serene charm of Yerres was the inspiration to Caillebotte's beginnings in drawing and painting. He found many subjects along the river, including birds, animals, trees, and flowers. Caillebotte was also prone to depicting his parents and brothers and their daily domestic activities. His painting, Young Man at His Window, 1875, shows René in the family home on rue de Miromesnil; in The Orange Trees, 1878, Caillebotte painted Martial Jr. along with his cousin Zoë in the garden at Yerres, and Portraits in the Country, 1875, includes Caillebotte's mother, his aunt, cousin, and a family friend. Even though he showed an inclination towards art, Caillebotte earned a law degree in 1868, and a license to practice law in 1870. Before he was able to start practicing law, Caillebotte was drafted for the Franco-Prussian war. He served in the Garde Nationale Mobile de la Seine. After the war Caillebotte began visiting the studio of painter Léon Bonnat, where he began to seriously study painting and began to meet and befriended several artists including Edgar Degas and Giuseppe de Nittis. As a result he attended (but did not participate in) the first Impressionist exhibition of 1874. In 1874, Gustave Caillebotte made the acquaintance of several up and coming artists including Edgar Degas, Claude Monet, and Pierre-Auguste Renoir. He loved their art and admired their talent. He was also very interested in the new style of painting that the group was introducing in Paris, a style that created a movement known as Impressionism. Upon meeting the artists, Caillebotte helped them to organize and fund their first major group exhibition in Paris. Caillebotte, the only one with any serious financial means, would become a main patron and supporter of the group, as well as becoming a member with his own art. He constantly bought paintings of his friends for high prices and supported the expenses of their exhibitions for the next six years. The group expanded to include Camille Pissarro, Paul Cezanne, Alfred Sisley, and Berthe Morisot. In 1876 Caillebotte decided to showcase several of his paintings, instead of working behind the scenes. Upon the death of his father in 1874, followed by that of his mother in 1878, Caillebotte received a sizable inheritance that gave him the freedom of painting without the pressure and need to sell his work for money. The year before Caillebotte's this exhibition he tried submitting work to the Official Salon in Paris, but was refused entry. As a result he entered the same painting, The Floor Scrapers in this exhibition and gained some attention. Gustave Caillebotte. Paris Street, Rainy Day. 1877. Art Institute of Chicago. 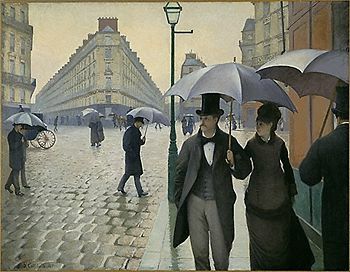 Caillebotte's Paris Street; Rainy Day, considered his masterpiece, was begun in 1876, and finished early in 1877. It shared the spotlight with Pierre-Auguste Renoir's Ball at the Moulin de la Galette, now in the Musée d'Orsay, Paris, and Claude Monet's series of the Saint-Lazare train station at the Impressionist exhibition of 1877. It's massive size, almost 7 feet by 10 feet, drew a great deal of attention. His dramatic views of modern Paris street scenes reflect the beginnings of a burgeoning bourgeoisie that changed the face of the city by tearing up old Parisian quarters and installing new thoroughfares, buildings, bridges and railroads. He was equally adept at evoking the lower classes feelings of urban isolation as well as the elegance of the upper classes. His original style can be classified more as the Realism of Jean-Francois Millet and Gustave Courbet, as well his contemporary Edgar Degas. His paintings began creating quite a stir among the Parisian elite who frequented the exhibitions. They were shocked at the lower-class subjects depicted in Caillebotte's paintings, a well as the calm and serene activities that Caillebotte's subjects were seen participating in. Caillebotte's style brought something new to the world of art, and many critics claim it was his interest in photography that led to his unique perspective. Several of his paintings showed a tilted ground, cropped pictures, and paintings that looked as if one had "zoomed in" on the subject matter. A large number of his paintings also show a very high vantage point, as if they were painted out on a balcony looking down. The most famous of these paintings are Vue des toits, effet de neige, 1878, and Boulevard vu d'en haut, 1880. Caillebotte's work turned more toward Impressionism when he moved to the house at Petit Gennevilliers on the Seine river, opposite Argenteuil, where so many impressionist painters lived and painted. He was also a serious student of marine engineering and this interest in water sports and in Impressionism resulted in two early works, Swimming and Fishing. In 1882, his Sailing Boats at Argenteuil and The Basin at Argenteuil were his best Impressionistic efforts. 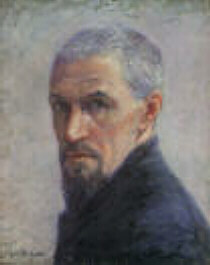 In total, Caillebotte painted over 500 works, but his remarkable abilities went largely ignored because most of his paintings were owned privately by family and friends and were neither exhibited nor reproduced until the later part of the twentieth century, except for the retrospective following his death twelve years later. As his works were rarely seen and without any reproductions in general circulation, they were largely forgotten when histories of Impressionism were written. During the 1890s Caillebotte's painting career slowed dramatically because of his decision to stop painting large canvases and exhibiting his work. As a result he turned his attention to gardening, yacht building, and racing. Caillebotte died suddenly in his garden at Petit Gennevilliers in 1894. Autopsy results said that the cause of death was a pulmonary congestion. Caillebotte was buried in the famous Père Lachaise Cemetery in Paris. I give to the French State the paintings which I have; nevertheless, since I want that this donation be accepted and in such a manner that the paintings go neither in an attic nor in a province museum, but well in the Luxembourg Museum and later in the Louvre Museum, it is necessary that a certain time passes before execution of this clause until the public, I do not say understand, but admit this new painting. This time may be twenty years at the maximum. Until then, my brother Martial, and at his defect another of my heirs, will preserve them. I request Renoir to be my executor. Caillebotte's collection consisted of sixty-eight paintings by various artists: Camille Pissarro (nineteen), Claude Monet (fourteen), Pierre-Auguste Renoir (ten), Alfred Sisley (nine), Edgar Degas (seven), Paul Cézanne (five), and Édouard Manet (four). This collection was reluctantly accepted by the state because at the time of his death, the Impressionists were shunned and condemned by the art establishment in France. Caillebotte understood this, and thus the stipulation that the paintings could not go into attics and provincial museums. In 1897, a room named after Caillebotte opened in the Luxembourg Palace and displayed the first exhibition of Impressionist paintings ever in a French museum. It contained 38 of the paintings that Caillebotte had left to the state. The other twenty-nine paintings (with one going to Renoir as payment for his services) were offered to the French government in 1904, and then in 1908, and both times the French refused to take them. In 1928, the government decided that they now wanted the paintings and attempted to claim them, however this time they were refused. Most of the remaining works were bought by Albert C. Barnes, and are now held by the Barnes Foundation of Philadelphia. Forty of Caillebotte's own works are now held by the Musée d'Orsay. His L'Homme au balcon, boulevard Haussmann, painted in 1880, sold for more than $14.3 million in 2000. ↑ Answers.com, Gustave Caillebotte. Retrieved August 23, 2007. ↑ Artic.edu, Caillebotte's Modern Aesthetic. Retrieved August 22, 2007. ↑ Elenore Welles, Gustave Caillebotte. Retrieved August 22, 2007. ↑ Muriel Julius, Gustave Caillebotte—Painter of a New Paris. Retrieved August 23, 2007. ↑ Impressionniste.net, Impressionism. Retrieved August 23, 2007. Kirk Varnedoe, The Museum of Modern Art,"Gustave Caillebotte", The Artchive. Welles, Elenore Gustave Caillebotte Artscenecal.com. This page was last modified on 21 July 2017, at 15:06.